This beautiful hanging glass print features four of the seven dwarfs - Happy, Grumpy, Doc, and Dopey - and comes with a display ribbon. 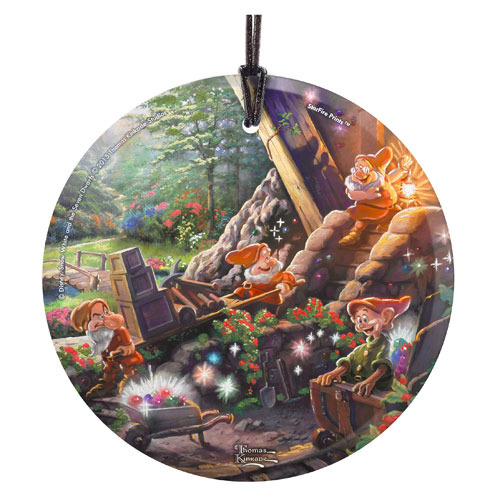 Translucent yet vibrant with color, the 3 1/2-inch diameter Snow White Thomas Kinkade StarFire Prints Glass Ornament is designed to capture the natural light, making it a true piece of art. The glass is scratch and fade resistant, and it arrives ready for display. Made in the USA. The story of Snow White and the Seven Dwarfs is a true classic that's loved by all ages. Now Thomas Kinkade Studios has created an amazing image that captures this magical Disney movie, and you can own it on glass with this print!